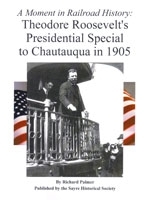 A 34-page soft cover booklet covering President Theodore Roosevelt's 1905 visit to Chautauqua, N.Y. over the Lehigh Valley and Erie Railroads including stops in Sayre, Pa. and Waverly, N.Y. Railroad historian Richard Palmer recounts the challenges to railroad management to safely transport the 26th President. This story is based on an official memo issued by the Erie Railroad for the Chautauqua Special and includes contemporary newspaper accounts, photographs and excerpts of speeches given at various stops. Stock#0213 Price - $9.43+.57 tax ...Total $10.00 plus $5 shipping and handling.